A ZIP code directory for the Central Florida area. This directory was created in June of 1984 and published in November of that same year by the U.S. Postal Service (USPS). The directory explains how to use the dictionary, how to use ZIP codes in addresses, and what ZIP codes are. The directory also contains the locations of the various post offices within the Central Florida Area and the various ZIP codes within. Before the implementation of ZIP codes, the U.S. Post Office Department (USPOD) used two-digit postal zones for large cities, beginning in 1943. Postal employee Robert Moon (1917-2011) first suggested a system of ZIP codes in 1944, but the concept was not implemented until 1963, USPOD introduced five-digit ZIP codes, as well as two-letter state abbreviations, nationwide. In 1983, a year before this directory was published, USPS introduced ZIP+4, an expanded ZIP code system with four additional digits to identify a geographic segment within the five-digit ZIP code area. Original directory, November 1, 1984: Private Collection of Texann Ivy Buck. Digital reproduction of original directory, November 1, 1984. "ZIP Code." United States Postal Service. https://about.usps.com/publications/pub100/pub100_029.htm. "Significant Years in U.S. Postal History." United States Postal Service. https://about.usps.com/publications/pub100/pub100_076.htm. “U.S. 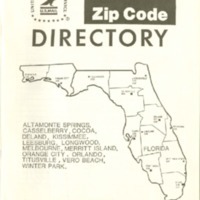 Postal Service Florida ZIP Code Directory, 1984.” RICHES of Central Florida accessed April 24, 2019, https://richesmi.cah.ucf.edu/omeka/items/show/7669.